Was your home damaged as a result of the flooding that took place in Richland County, August 17 – September 14, 2018? Richland County was awarded Community Development Block Grant-Emergency Assistance funds to aid homeowners that had damage to their homes as a result of the flooding that occurred August 17 – September 14, 2018. NHS of Southwest Wisconsin is contracted to administer the funds and are currently accepting applications for assistance. Does the home you own need repairs? 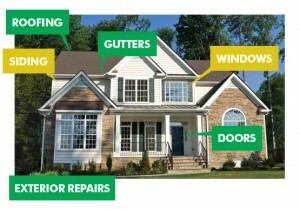 Do you need financial assistance to complete those repairs? If so, you may qualify for a Home Owner Rehabilitation Loan through NHS of Southwest Wisconsin. UPDATED higher income limits may mean you are eligible! Home Owner Rehab loans are available to residents of Richland County for needed repairs such as a new roof, window replacement, septic system, electrical wiring and more. Visit the NHSSW Home Improvement Loan Program Page for more information! Ice Cream Social and Culvers Share Night are both Successes! Thank you very much for a very successful National NeighborWorks week! We served over 125 ice cream sundaes and delivered numerous orders at Culver’s of Richland Center! 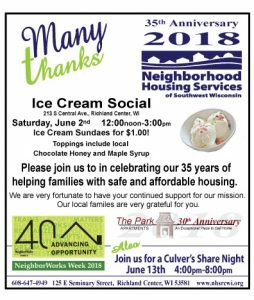 The Park Hotel Senior Citizen Apartment building is the setting for an Ice Cream Social on Saturday, June 2, 12:00/noon – 3:00pm. Ice cream sundae’s will be served for $1.00 and toppings include local Chocolate Honey and Maple Syrup! Join us on Wednesday, June 13th 4:00pm-8:00pm at Culver’s of Richland Center for a Share night. Was your home built before 1978? Have chipping, peeling, or cracked paint? Contact Public Health at your local Health and Human Services or NHSSW at 608-647-4949 for more information on how to detect and remove Lead from your home. Visit the CDC Website for more information. Emergency Assistance Application Deadline is March 31, 2018! Was your home damaged by the 2016 and after flooding that occurred in Southwest Wisconsin? Richland County Home Owners who had damage to their home from the 2016 and after flooding could be eligible for funding if the damaged home is the owner’s principle place of residence and the property household is at/or under 80% County Median Income. Richland County Home Owners may be eligible for a grant to make needed repairs or be reimbursed for repairs already made and eligible insurance deductions. If your home was damaged as a result of the flooding that took place in Richland County, September 1, 2016 and after, don’t wait to apply! Deadline for NHSSW to accept applications for CDBG-EAP funding is March 31, 2018. Call Violet at 608-647-4949, ext. 307 for more information, request an application or make an appointment to discuss the funding. Neighborhood Housing Services of Southwest Wisconsin (NHSSW) distributed net proceeds to community partners in a photo awards ceremony on Tuesday, July 5 in the Community Room of the Park Hotel Senior Center Apartments from the Big Top Chautauqua (BTC) VIII collaborative community building annual fundraiser. Visit our Big Top Chautauqua Page for more details and a list of our wonderful sponsors. Homebuyer Education Seminar is Saturday, April 29! Homebuyer Education through NHS of Southwest Wisconsin is one of the best decisions you will make on your path to homeownership. We look forward to answering your questions and giving you the tools you need to succeed. We encourage anyone interested in homeownership to take this first step in preparing themselves. There are no income limits or other restrictions; homebuyer education is open to anyone. 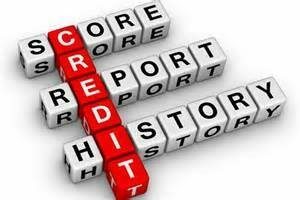 The information covers topics specific to the home buying process, such as mortgage lending, the realtor’s role, inspections, and home maintenance. Area professionals present the information and answer questions in a group setting. Next Seminar is Saturday, April 29th! Park Hotel Apartments Open House! As part of National NeighborWorks Week and Ocoochopalooza Downtown Events, NHS of Southwest Wisconsin will feature an OPEN HOUSE at the historic Park Hotel Senior Citizen Apartments in downtown Richland Center. On Saturday, June 4 from 9am – 12noon The Park Hotel Senior Citizen Apartments Open House will have apartment tours and refreshments. Applications be available for residency and the wait list. The nationally recognized Park Hotel Senior Citizen Apartments, a WHEDA and City of Richland Center partnership funded independent elderly living project has been in operation since 1987, is conveniently located in heart of the historic commercial district in downtown Richland Center. NHS of Southwest Wisconsin, “America’s 1st rural NHS” in the NeighborWorks America national network founded in 1983 owns and manages the Park Hotel Senior Citizen Apartments and developed unused basement space for core offices.